Formula 1 and Circuit of The Americas are proud to announce the F1 Future Stars program, a once-in-a-lifetime opportunity for the next generation of great drivers to participate in the pre-race ceremony at the FORMULA 1 2018 UNITED STATES GRAND PRIX. Twenty F1 Future Stars, ages 7-10 years old, will stand alongside the 20 best drivers in the world for the national anthem and grid ceremony on Sunday before the green flag flies for the USGP. 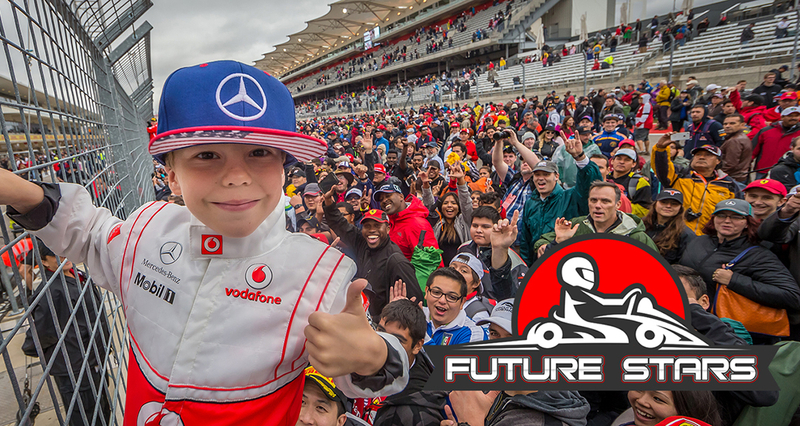 The remaining ten F1 Future Star spots will be filled in conjunction with COTA's local non-profit partners, including Seton/Dell Children’s Hospital, Operation Supply Drop (supporting military families), and the Boys and Girls Club of Austin, among others. Tickets for the FORMULA 1 2018 UNITED STATES GRAND PRIX, set for October 19-21 are on sale now through circuitoftheamericas.com. The weekend also includes performances by superstars Bruno Mars (Saturday, October 20) and Britney Spears (Sunday, October 21). Three-day race tickets which include access to both headlining concerts along with other featured entertainment including an additional 30+ Texas based bands soon to be announced, start at $169 and are also on sale now through circuitoftheamericas.com. Sunday only bleachers and Sunday only Premium Stand tickets are available for purchase as well as along with premium on track viewing upgrades for both concerts.